"Craftsmanship in the Graphic Arts." resource. Cherokee has always kept its core traditional foundation, continuing to grow with digital technology, craftsmanship and quality, despite any solid reliance on current technical trends. We have used technology just as another tool, however it will not consume us to the extent of never knowing who the print job is for, or the special attention you deserve from online printing. 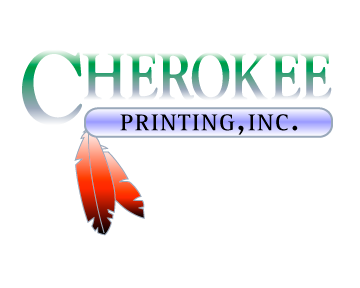 At Cherokee Printing, Inc. we are always here to answer any questions regarding printing estimates and online printing. We will review your estimate requests individually and make it a point to satisfy any curiosity you may have about our company or online printing services. We suggest our online customers use our estimate request form to give us a brief description of your printing, so we can provide you with an accurate estimate. We have always stressed that communication is the most important part of printing. At Cherokee, we welcome answering any questions that may arise, including both present customers and prospective online customers. Our phone lines are open and you will always speak to a helpful representative in real time. All emails will be responded to because we place a great deal of emphasis on our quality services, printed products and above all, our customers. We accept any online printing challenge to prove our efficiency, quality and customer service abilities. At Cherokee our services in digital prepress, creative layout and design, printing and finishing are all completed in house, including the preparation and preflighting of graphic files. Very rarely do we see the need of outsourcing work our customers trust us to complete in our production house. We do not take new customers for granted. Our commitment to quality makes us stand out and we're looking forward to producing your next online printing project. You will stand out also. "This is Cherokee Printing and our commitment to verified quality color printing."